Aspen senior Nina Christiansen (31) waits for the lacrosse ball to come back to earth during Thursday's game against Fruita Monument. Aspen teammates Libby Dowley (6) and Shannon Turbidy (9) follow the play. The Skiers are making a habit of close games, thrilling finishes and winning close games with thrilling finishes. 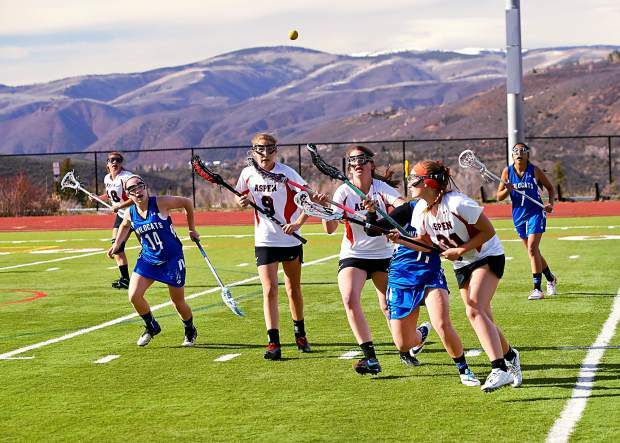 Exhibit B: The Aspen High School girls lacrosse team took over sole possession of first place in the Mountain League on Thursday afternoon with a hard-fought 8-6 victory over Fruita Monument on the AHS turf field — the team’s second consecutive pressure-packed conference game. Exhibit A: On Tuesday, the Aspen girls pulled out a blood pressure-boosting 14-13 triple overtime sudden-death win at Battle Mountain. Two days later, the Skiers pulled out a home-turf win over the high-scoring Wildcats using opportunistic offense and a stubborn defense anchored by goalie Hannah Clauss. The Aspen sophomore faced a barrage of Fruita Monument shots — 25 unofficially — in handing the Wildcats (11-2 overall, 6-1 in league) only their second loss of the season. She said the Skiers (10-2 overall, 6-0 in league) were comfortable in a close game, particularly after playing in the pressure of a sudden-death contest earlier. Clauss, the daughter of Candice and Andy Clauss, saved her best saves for last. The Wildcats, after witnessing an Aspen offense that scored four consecutive goals to turn a 5-4 deficit into an 8-5 lead, stormed back in the closing minutes of Thursday’s sun-soaked showdown. Fruita Monument pressured with multiple shots, eventually drawing a foul in front of the Aspen goal. Junior Adrienne Chiapuzio scored for the Wildcats on the restart after the foul, cutting Aspen’s lead to 8-6 with 1:49 to play. The Wildcats controlled the ball and attacked immediately, again forcing fouls deep in the Aspen end. “They just kept shooting and shooting and shooting,” Clauss said. And she kept saving and saving and saving each and every shot, including wide-open shots on restarts. Thursday’s showdown of the conference leaders opened with a flurry of goals by the Skiers, who were still buzzing from the dramatic victory at Battle Mountain. Aspen, with quick passing out of the midfield, scored four goals in the first 6 minutes of the game — all from different players. Kendall Anderson started the scoring with a wraparound goal from behind the Fruita Monument goal. Shannon Turbidy, who scored the game-winner in overtime against the Huskies, scored the second Aspen goal. She would add two more in the second half. Juliette Woodrow took advantage of a Wildcats’ turnover to score Aspen’s third goal. And Sarah Chiles put the Skiers ahead 4-0 on a restart in front of the Fruita Monument goal. Fruita Monument would score the next five goals in a row — taking a 5-4 lead midway through the second half. Lindsey Burenheide, working behind the Aspen goal, offered up assists to Reinnah Norcross and Chiapuzio, and Fruita Monument cut Aspen’s halftime lead to 4-2. The Wildcats took the lead when Burenheide scored back-to-back goals and Chiapuzio potted her second goal of the game. But Dowley regained momentum for the Skiers with a goal just 14 seconds after Fruita Monument had taken the lead. Turbidy added back-to-back goals before Dowley scored her second goal of the game on an assist from Claire Boronski. Aspen’s final score with 8:01 to play set the stage for Clauss’ defensive heroics. She said the Skiers’ win at Battle Mountain helped them up their level of play for the league showdown against Fruita Monument. The Skiers will host Summit on Tuesday.